Tagline: You have the right to remain silent. Forever. When we talk about cinema’s most underrated monsters, Matt Cordell must be right up there with the best of them. Known simply as Maniac Cop, Cordell is a brute of a killer, a zombified variation of Friday the 13th‘s Jason Voorhees, with the same superhuman strength and nondiscriminatory appetite for murder. Directed by exploitation junkie William Lustig (Maniac) and written by the delightfully satirical Roger Corman (The Stuff), the movie would prove a financial failure at a time when slasher movies had become largely generic and commercially passé, but if this had been released half a decade earlier, I’m convinced we would be talking about Cordell in the same breath as Krueger and co. Ceaseless, intimidating and veiled in curmudgeon mystique, the character has all the ingredients of a bona fide horror icon, with a delicious pretence that has victims flocking to their deaths like lambs to the punitive slaughter. Work would go ahead as planned. The man tasked with stopping Cordell is genre legend Tom Atkins, typically likeable as whiskey-swilling detective Frank McCrae, a man who lives and breathes his profession with a pulp charm that proves hugely endearing. As bodies fall thick and fast, the cops are baffled by a seemingly motiveless killing spree, and when news hits the streets about our homicidal boy in blue, innocent cops are gunned down by terrified citizens fearing the very worst. 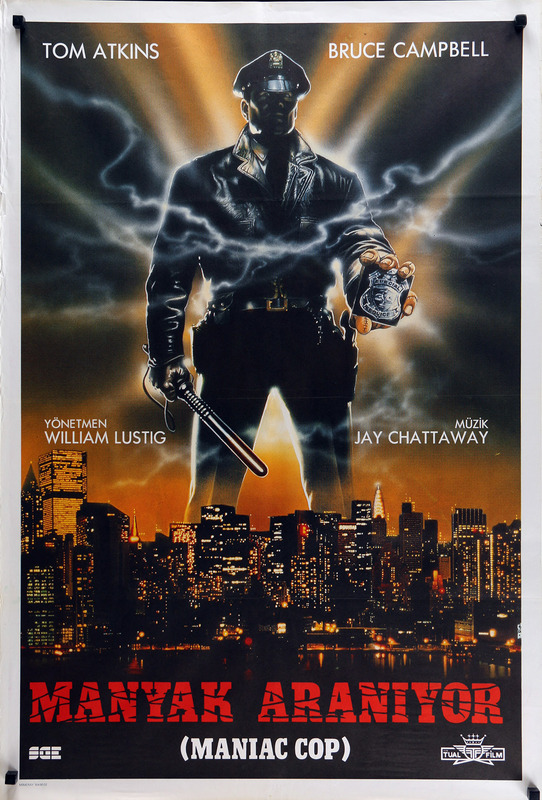 With city officials in a panic, the law is desperate to land their man and bring peace to the streets of New York City, so when officer Jack Forrest (Raimi) is framed for the murder of his wife, they are only too eager to condemn him. 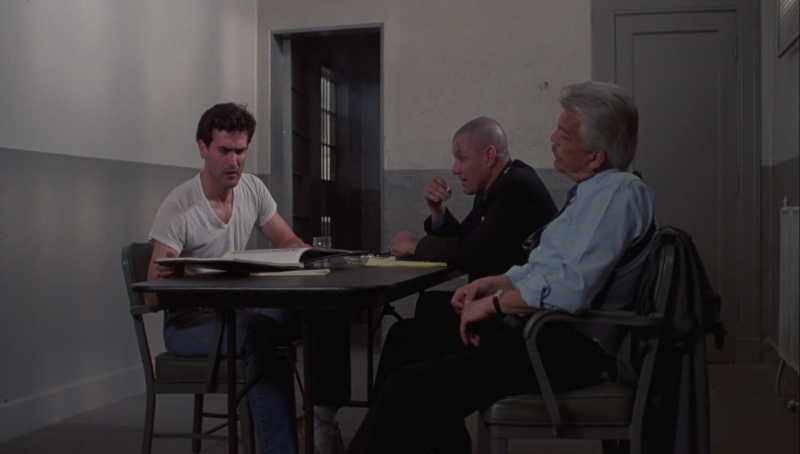 Luckily for Forrest, McCrae remains unconvinced, and when investigations lead him to a trigger-happy super cop supposedly killed in prison, it becomes increasingly apparent that Cordell has risen from the dead to enact his revenge on the city officials who sealed his fate. The cast are largely suspicious of Forrest’s claims — who wouldn’t be? — but Cordell wastes no time validating their assumptions. Cordell finally catches up with the infamous toothpick hijackers. 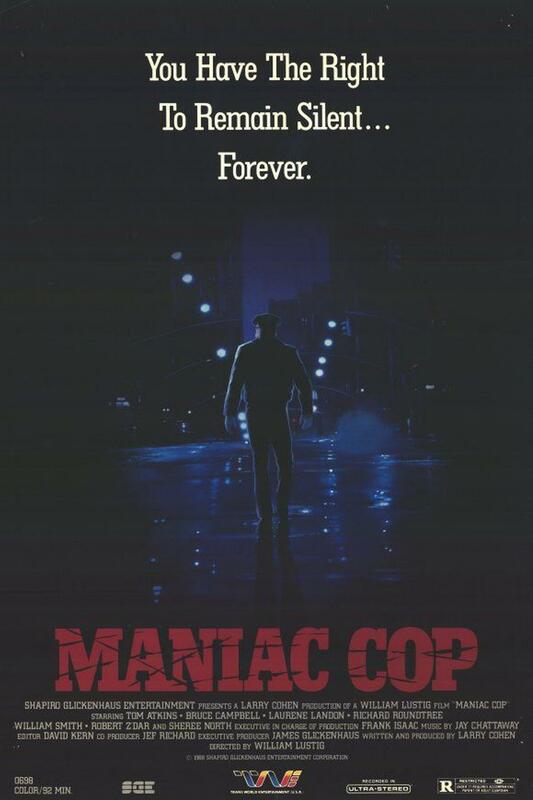 In spite of its commercial shortcomings, Maniac Cop has achieved a lofty cult status in the years since its release, and would spawn a couple of increasingly ludicrous and highly enjoyable sequels, each descending further into the realms of the self-reflexive. Much of the film’s status can be attributed to a wonderful supporting cast, which reads like a who’s who of B-movie royalty. As well as the always appealing Atkins we have Evil Dead icon Bruce Campbell in his first non-Raimi role, one he would begrudgingly take for financial reasons. We also have a couple of Cohen mainstays in Blaxplotation icon Richard Roundtree, going against his anarchic roots as the self-serving Commissioner Pike, and the sumptuous and effervescent Laurene Landon as Forrest’s resourceful squeeze, a close friend of the writer who came as part of the package. Much to the annoyance of his co-stars, Bruce would insist on bringing his lines to the shoot. A satire it may be, but make no mistake about it, Cordell is as brutal as they come. 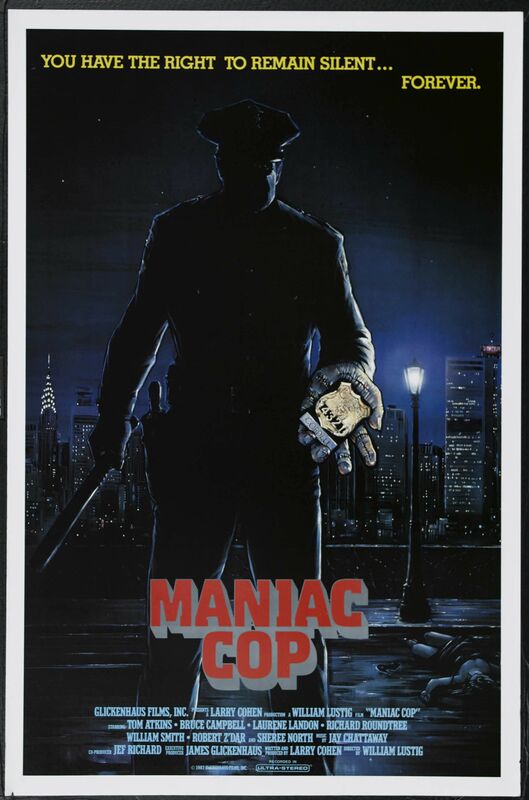 Suited and booted and armed with a nifty sword that doubles up as a standard issue nightstick, our eponymous maniac is as intangible as Krueger and as relentless as Voorhees, with an infectious mystique that has franchise written all over it. An upcoming reboot may prove an interesting prospect for fans of the series, finally giving the character the mainstream platform he so richly deserves, although something tells me the concept works best as the grainy dose of exploitation it was first conceived as. Editor’s note: the reboot has since been committed to the slush pile. For this I think we can all be thankful. Stopping to accost a young couple stuck at some traffic lights, our zombie law enforcer requests the man’s presence outside his vehicle, a request his girlfriend suggests he acquiesce with. Moments later, our savage brute grabs the citizen by the throat and subsequently snaps his neck like a pencil, launching him like a flesh missile through the windscreen of his parked car. Not even Jason possesses that kind of strength! After handcuffing an innocent man who stumbles out of a bar, Cordell pursues his victim through the smoke-strewn city streets before ramming him face first into some wet cement, leaving a rather curious death scene for the morning beat to attend to (see above image). But why would the cement still be wet at such a late hour? Perhaps the mixers had nipped off for a bit of late night supper, or maybe even a floodlight so they could see what in the hell they were doing. Raging Bull‘s Jake LaMotta makes a brief cameo as an NYPD detective. During the autopsy of Cornnell’s first murder, detective Frank McCrae gets the wrong end of the proverbial stick. Coroner: We have a C2/C3 fracture dislocation. The head was unstable and there was a sudden deceleration injury. The residual hanging where the head just “pops”; that’s not what’s interesting. What’s interesting is we have a crushed larynx. The head’s just flopping. Frank McCrae: You’re tryin’ to tell me two kids did this? 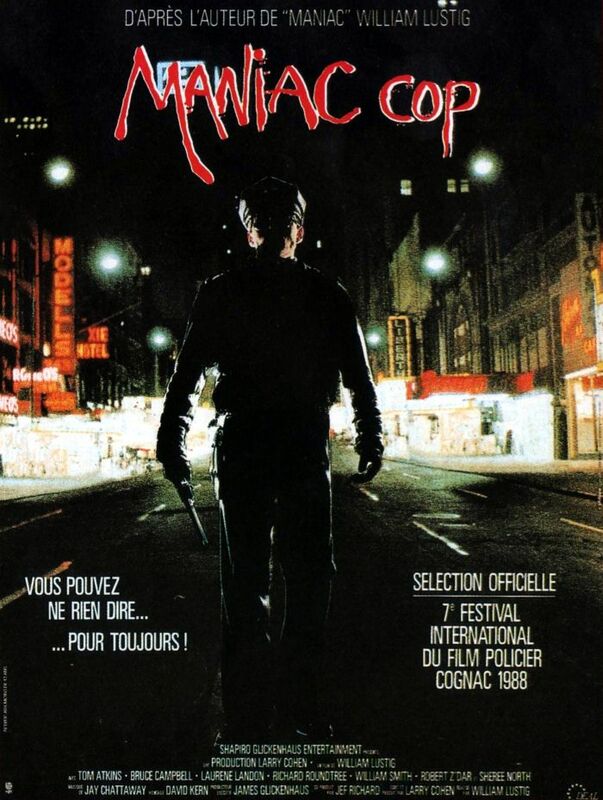 Maniac Cop‘s Matt Cordell is a Frankenstein’s monster of modern horror icons, a beast whose brutal shenanigans will please genre fans no end. Add to this an eerie theme of lullaby menace and you have all the ingredients for a horror classic. A harshly overlooked addition to the slasher canon which fully deserves the cult status it would later achieve.